There's no feeling like seeing your bundle of joy for the first time. 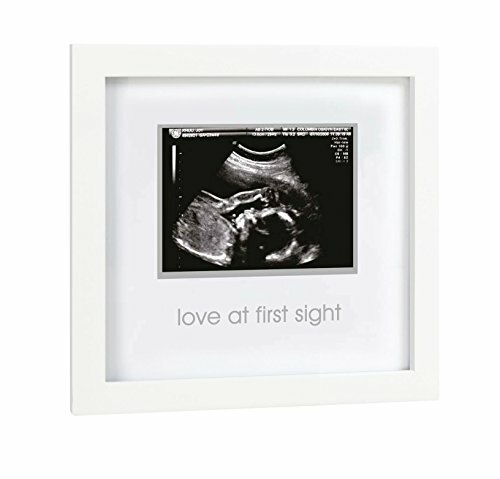 Pearhead's Sonogram Frame lets you display your baby's sonogram photo in this classic hand-finished, wood frame. Acid-free beveled mat protects your precious sonogram photo so that it lasts a lifetime. Includes the phrase 'love at first sight' stamped in silver, hanger for easy wall mounting, and easel to display on a tabletop. Celebrate this special moment forever with this great keepsake. This frame makes an excellent baby shower gift or as a gift for new parents, grandparents, aunts, uncles or other loved ones. Also makes a great baby registry item! Don't forget to use the hashtags #pearhead and #mylittlepearhead for a chance to be featured on Pearhead's social feeds! At Pearhead, we aim to create genuine, quality products to celebrate your special moments in life. We are a family of designers, marketers, and trendsetters bringing products to life that will bring a smile to your face. From concept and design to production and customer service, the Pearhead team works together seamlessly every step of the way. Whether your baby is celebrating their first year of life, you are announcing your pregnancy, or your pup is celebrating his first holiday season, Pearhead is here to share your moments in style. Product Dimensions: 6.75" L x 7" W x .6" D. Photo Opening: 3" x 4". Don't forget to use the hashtags #pearhead and #mylittlepearhead for a chance to be featured on Pearhead's social feeds! Celebrate this special moment forever with this great keepsake. This frame makes an excellent baby shower gift or as a gift for new parents, grandparents, aunts, uncles or other loved ones. Also makes a great baby registry item!